Golf Days » Champ Marketing » 23 Years Young! Want to organize a Golf Day? Look no further – Champ Marketing is the no. 1 company to organize your company golf day. A golf day is not just a unique way to promote your company, but it is also a great opportunity to network with your clients and potential new clients. Golf Days are not organized in two weeks; it can take up to five months to organize a professional golf day. 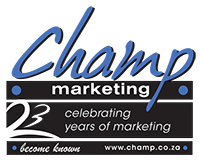 Champ Marketing have regular meetings with there clients as the Project progress. The Champ Team will organize the event professionally. They will invite the players, organize the registration, make sure there are waterholes, arrange for entertainment, arrange for half way house and supper. The Champ Team is the one STOP Company to arrange a complete golf day.